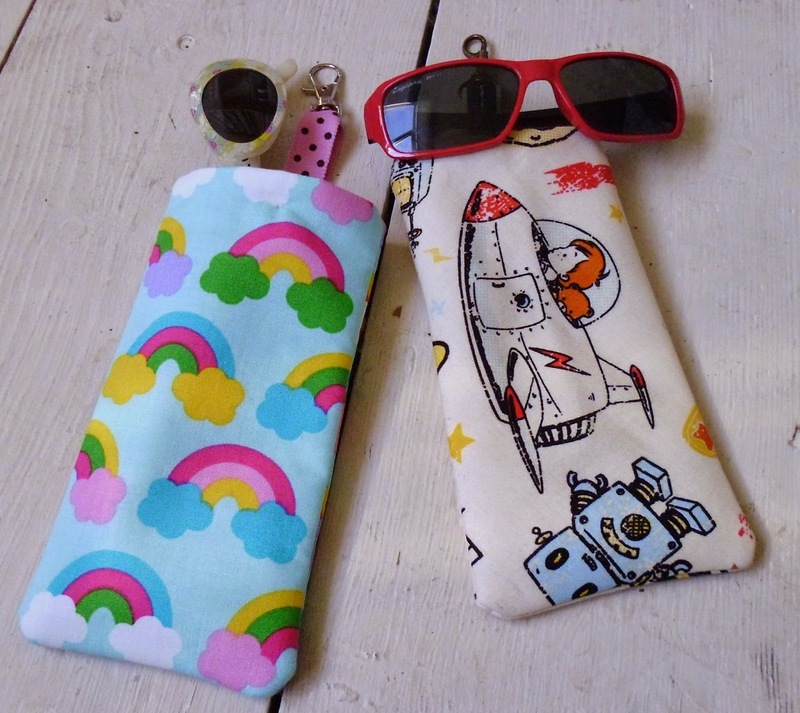 These gorgeous Sunglasses Cases are designed to help children keep their glasses or sunglasses safe and sound. The cases have a handy swivel hook to enable them to be attached to bags or clothes. They are slightly padded to prevent breakages. Just enlarge the pattern to make adult size cases. 56cm x 50cm Fusible Fleece or Wadding. I used Vilene H640 Pellon. You could use a split ring rather than a swivel clip or make a wrist strap. Perfect for attaching to school bags for children who wear glasses to school. Can be used to store glasses during PE etc. 1) Cut two 18cm x 10cm pieces of fabric from the main fabric, lining fabric and fusible fleece. Attach the fusible fleece pieces to the back of the two main fabric pieces using a warm iron. Make sure they are securely attached. 2) Lay one piece of the main fabric on a table, pattern side facing up. Thread your swivel clip onto the ribbon so it is half way down and place the ribbon facing downwards as in the photo. 3) Place a lining piece of fabric, pattern side down on top of the main fabric and pin along the top of both (make sure the ribbon is kept in place). Sew along the top using a 1cm seam allowance. Unfold and press flat. Repeat without the ribbon for the remaining pieces of fabric. You should have 2 long rectangular pieces of fabric each with a joining main fabric and lining fabric. 4) Place the two long rectangles of fabric on top of each other so the pattern sides are facing with the main pieces of fabric together and the lining pieces of fabric together. Starting at the bottom left hand side of the lining fabric, sew up to the top of the main fabric, along the top and back down the other side. Leave the short side of the lining fabric open. 5) Pull the top of the case through the open end of the lining until all of the pattern side of the fabric is showing. Poke out the corners with your fingers. Press the main case and the lining fabric. 6) Fold under approx.1cm of the end of the lining fabric on both sides and press. Sew along the edge to close the opening. 7) Push the lining fabric back inside the main case making sure that you poke the corners of the lining into the corners of the main case so that the lining is sitting flat. Press again. Sew on a press fastener. 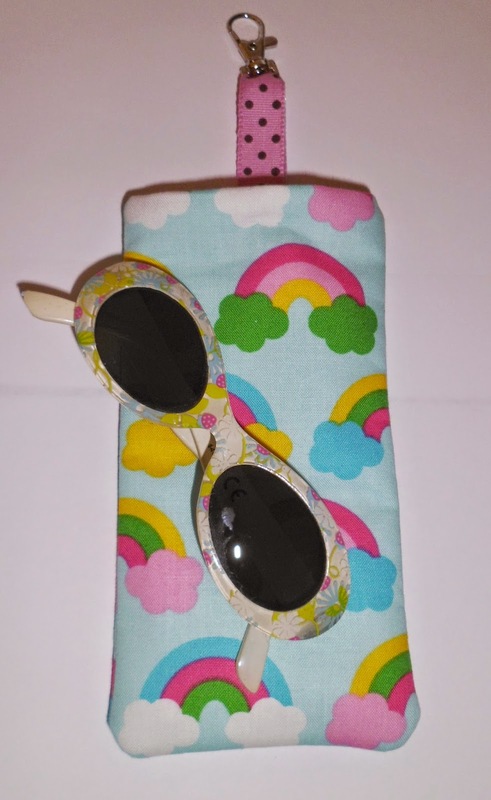 Pop over to the Sew Scrumptious facebook page and share photos if you make a sunglasses case. We would love to see them!